We are very excited to announce that we will be working with Barry Ball Artists to deliver our sensational headline show! Telling the story of how we met, fell in love and travelled the world together playing music, we include amazing anecdotes from our tours performing for the troops on the front lines in Afghanistan – all the while delivering a wonderful repertoire of our favourite chart-topping tunes. Posted in News on May 20, 2016 by samandandymusic. We recently visited the wonderful city of Liverpool for the first time and headed straight for the famous Cavern Club. Walking down the stairs, the sounds of the Beatles floated up to our ears. It felt like we had been transported back to 1961 – it couldn’t have been more perfect! So we grabbed a pint and watched an awesome Beatles tribute duo play on the famous arched stage – all the while singing along to our hearts’ content. A week later, filled with inspiration under another famous arch, we decided to record one of our favourite Beatles tracks in one of our favourite European cities. So here is our acoustic cover of ‘Eleanor Rigby’ filmed on location in the wonderful Praça do Comércio in Lisbon by our brilliant photographer/videographer friend Oliver Turpin (@ChronicleUK). Posted in News on April 21, 2015 by samandandymusic. Sam & Andy: From Cape Horn To Norway… And we’re back! There are some moments when we feel so lucky that we get to play music for a living. Over the last few months our work has taken us around the world to some amazing places and we’ve met some beautiful people. From vibrant Buenos Aires and Valparaiso to enchanting Portugal and breathtaking Norwegian fjords and glaciers – it’s been an exciting adventure! But what’s more exciting is that we have some new videos for you – the result of a collaboration with our wonderful photographer/videographer friend Oliver Turpin @ChronicleUK. Here is our first – an acoustic mashup of ‘Latch’ by Disclosure feat. Sam Smith and Oasis’s classic ‘Wonderwall’. Please enjoy and share with your friends. Keep an eye out for more to come very soon! For more videos (including original compositions) subscribe to Sam & Andy’s YouTube Channel. Posted in News on April 15, 2015 by samandandymusic. There is no doubt the jazz genre is one of vocalist Sam Hetherington’s biggest influences – a passion for which was passed down to her at an early age by her father ‘Nat’ Oliver Hetherington, a popular trumpeter and front man on the Sydney circuit in the 60’s, 70’s and 80’s. This early foundation was further nurtured when Sam began studying her Bachelor of Music at the Australian Institute of Music in 2007. Naturally leaning towards jazz as a genre, she gained influence from the greats Carmen McRae and Ella Fitzgerald, along with the discovery of more contemporary artists like Kurt Elling and Esperanza Spalding. Taken under the wing by some of Sydney’s most prestigious jazz players (Sean Coffin, Greg Coffin, Trish Delaney-Brown of vocal group Idea of North, Joy Yates), Sam loved the vocal side of jazz – everything from a soft ballad to a complex vocalese. 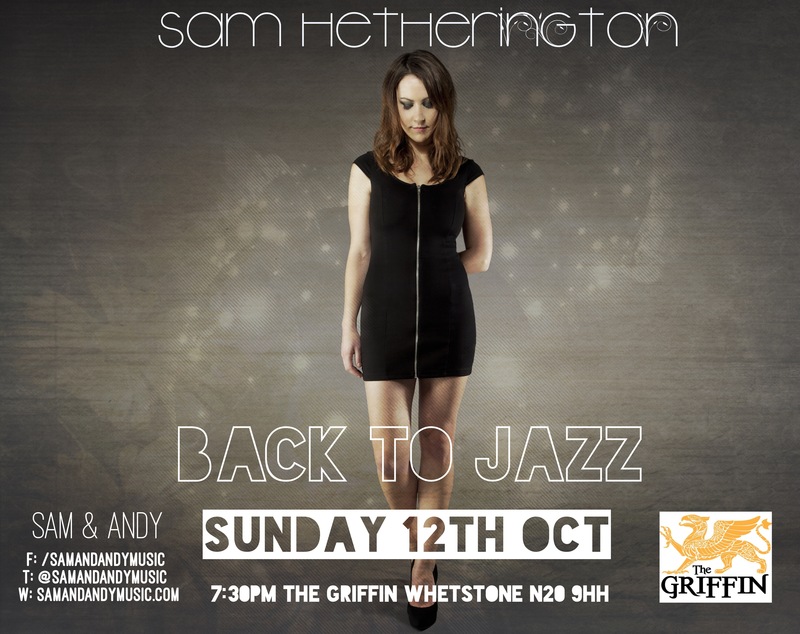 Now, after performing solidly for 5 years in the UK and abroad (one half of duo Front Cover and more recently Sam & Andy alongside guitarist/vocalist husband Andy Walton), Sam is going ‘Back to Jazz’ this Sunday 12th October to play a one off show – a collection of her favourite standards with a few special ones thrown in! The show will take place at wonderful local pub The Griffin, N20 9HH and she will be joined by the fantastic Griffin house jazz band comprising Gareth Hunt (piano), Steve Plumb (drums) & Wally Shaw (bass). This is a brilliant pub that has made a name for itself as one of the most popular music venues for quality live music in North London. In short – you don’t want to miss this gig! Posted in News on October 8, 2014 by samandandymusic. 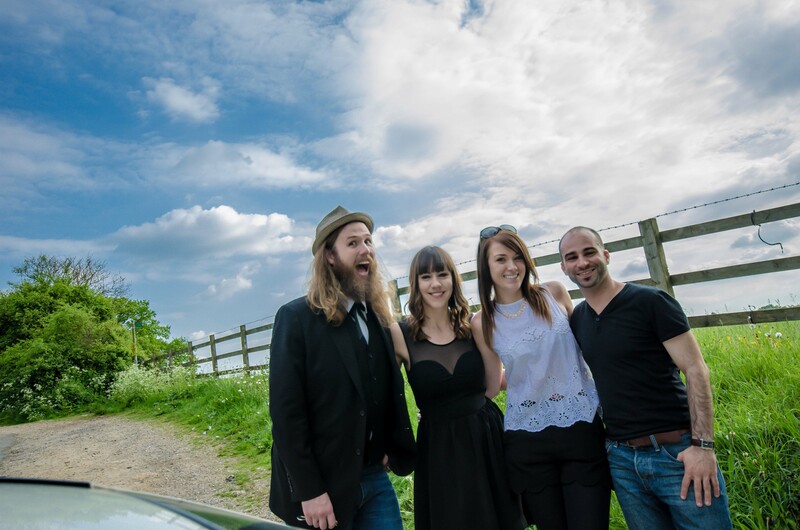 Join us on Friday 26th September for an exciting full band gig at one of our favourite South London pubs! The Charles Holden has great food, ambience, and is run by our favourite Aussie-in-London Rob (us antipodes gotta stick together!). We will be joined by Ollie Hopkins (bass) & Simon Bobba Swan (drums) to play simply anything that feels good – from blues & motown to soul & funk. This is going to be a great night – so don’t miss it! See you there for a big glass of wine (or three)! Posted in News on September 12, 2014 by samandandymusic. ‘A Slight Embrace’ now available on iTunes! Posted in News on June 10, 2014 by samandandymusic. We are so pleased to share ‘Merry-Go-Round’ with you – an original composition that we recorded at our flat here in London. We really hope you enjoy it! If you do, please share with your friends and keep an eye out for more videos coming soon. Posted in News on June 6, 2014 by samandandymusic.